For many years AméricaEconomía Intelligence has published its ranking of the best cities to do business in Latin America. The detailed study takes various factors such as the city’s PIB, its PIB per capita and the presence of investment banks into account. Other important elements are the unemployment rate and the number of destinations that the city’s airport serves. Miami has long been included in the ranking due to the fact that a significant amount of Latin American companies have their head offices in Florida. 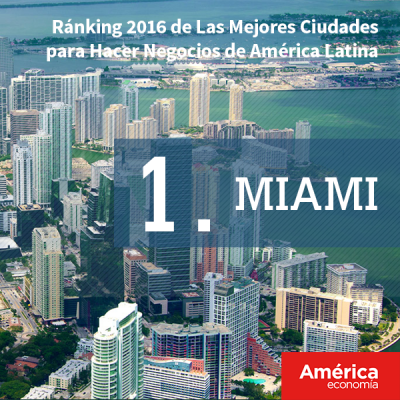 The other cities in the ranking face stiff competition, as Miami tends to receive top marks in nearly every category. Santiago de Chile is in second place with Mexico City coming in in third. Santiago managed to maintain its position due to the large presence of multinational companies in the city and its high score on the human capital index. The stability of the Chilean capital is its real strong point but environmentalists will be keeping an eye on the levels of pollution that have manifested themselves over the past few years. Smog has become a real problem for the city, which is situated in a bowl between the Andes and a coastal mountain range. The snowy peaks of the Andes are often hidden by a thick haze. Addressing this problem will be a big challenge for the city over the next decade. Mexico City managed to move up past Sao Paulo and into third place. The economic crisis in Brazil has had a significant impact on the Brazilian cities in terms of how they are viewed as good places to do business. Sao Paulo dropped just the one spot on the table but Rio de Janeiro slipped five places to 14th. With the political and economic turmoil set to continue over the coming year it is unlikely that Brazilian cities will be nearing the top of next years ranking. Due to the fact that Miami tends to steamroll the other cities in most categories it is interesting to examine the sections where Miami loses out to Latin American hubs. One area that stands out is suburban transport. The metro systems in Santiago, Mexico City and Sao Paulo provide hundreds of kilometres of underground rail networks, which manage to somewhat ease the pressure on their road systems. Unfortunately for Miami, southern Florida will never be an apt location for the construction of subways. A potential solution would be an upgrade of the over ground rail services currently available. Another area where Miami is lacking is in the presence of global companies. AE Intelligence compiled a list of 37 global companies whose presence was deemed important in a city looking to attract business. Miami enjoys the presence of only 15 of those companies with Santiago and Mexico City hosting 23 and 27 respectively. If one was to search for any faults it could perhaps be claimed that Miami is too focused on Latin America. However, for AméricaEconomía that isn’t necessarily a bad thing. AméricaEconomía is keenly read by a growing regional community of businessmen and businesswomen, entrepreneurs, executives and senior officials who need to understand the region from local, regional and global context.